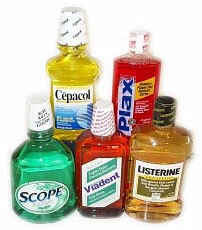 NYC Smile Design - BLOG - What’s in that Over the Counter Rinse? Alcohol and it’s almost 44 proof. Now we’re talking about liquor, and to keep it being taxed as liquor with the companies have done is to denature it making it completely unpalatable. In our practice we don’t see a valid reason for rinsing with alcohol based mouth rinses. Alcohol wipes out good and bad bacteria in the mouth, and eventually promoting or allowing the bad ones to proliferate. Also alcohol dries in the mucosa, and in chronic use, it has been shown that patients who are heavy users of these products are more susceptible to oral cancer. Polaxamer 407. This is a petroleum based detergents, and what it does is that it keeps oily ingredients in solution. FD&C green number 3. It’s use is as a food dye is prohibited in the European Union and has been found to have tumorigenic effects in experimental animals. Thymol- which is obtained from Thyme or Oregano. Beyond its culinary uses of the flowers and leaves caution is warranted in the use of thyme oil. It is used commercially and has been identified as having antibacterial properties and has been used in preservatives and sanitizers however,It’s effectiveness has been questioned. There are also questions whether it is a carcinogen and it is not recommended in pregnant or breastfeeding women. No safe levels have been determined for kids. As a side note; thyme oil was used by the Egyptians to embalm the dead. Methyl Salicylate-a compound similar to Aspirin. It’s also found in Bengay and Cigarettes. It can also relieve pain and aches like it’s cousin Aspirin. In overuse of this product that is in deep heating muscle ache creams it has caused seizures and difficulty in breathing with children. Sorbitol-a sugar substitute. It’s often used in diet foods, chewing gum, toothpaste and mouthrinses. Sorbitol can aggravate an irritable bowel syndrome. Too much of this product ingested can cause stomach pain, gas and diarrhea. Make your own decision if you want to use these rinses.